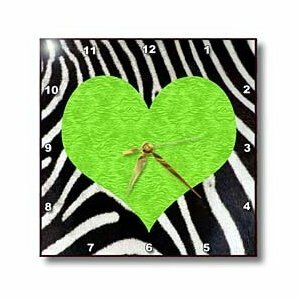 Punk Rockabilly Zebra Animal Stripe Green Heart Print Wall Clock is new, handcrafted utilizing unique process resulting in a stunning high gloss ceramic-like finish. Measures 10″ x 10″, comes with a wall mounting hook. Single AA battery is not included. Janna Salak Designs Prints and Patterns is an awesome collection of Animal print patterns expressing Janna’s love for nature and her dedication to bring environmental awareness to the world.